The Scottish Government has published the initial Invitation to Tender for the next Clyde and Hebrides Ferry Service contract. 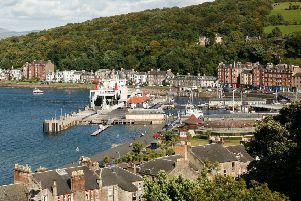 The initial invitation to tender for a new eight-year contract to provide ferry services to Bute, and throughout the Clyde and Western Isles, has been published by the Scottish Government. The 191-page document was issued to the two bidders - the state-owned CalMac Ferries Ltd and the private firm Serco Caledonian Ferries Ltd - on Friday, and published on the website of the government’s transport agency, Transport Scotland, on Monday. The final invitation to the two companies to submit their bids will be issued in December; the bids have to be in by January, and an announcement on the winner will be made next May. The new contract, which will be accompanied by a subsidy of up to £1 billion, is due to begin on October 1, 2016. To read the initial ITT, click here. Derek Mackay MSP, the Scottish Government’s transport and islands minister, said: “We have promised to make this procurement process fair, open and transparent, so we are publishing the Initial ITT document to make good on that pledge. Mr Mackay said the government was in the process of appointing an independent Procurement Reference Panel which will review both the initial and interim invitations to tender to ensure there is no discrimination against either bidder. Appointments to that panel - including councils, ferry user groups, trade unions and representatives of port and harbour authorities, tourism, business and health and social care groups - are “in the process of being agreed”, according to Transport Scotland’s announcement on Monday. The panel will not, however, be involved in assessing the final bids: that job rests solely with the Scottish Government’s ministers. The initial ITT was originally due to be published on July 10, but that date was pushed back by three weeks to allow for further talks between the Scottish Government, CalMac and the RMT and TSSA trade unions in the industrial dispute which led to a 24-hour strike by RMT members at the end of June. Those talks eventually led to an agreement being reached on July 8, just before a second 24-hour stoppage was due to take place.